As we reported late last year, the Supreme Court has recently agreed to hear a challenge to a critical national security tool—the material support statute. As we draw closer to Tuesday's oral arguments, the Investigative Project on Terrorism (IPT) has been closely following the legal proceedings. In particular, we have focused our analysis on the practical effect that the eventual ruling may have on America's fight against international terrorist organizations. "Foreign organizations that engage in terrorist activity are so tainted by their criminal conduct that any contributions to such an organization facilitates that conduct." U.S. law enforcement took this principle as a green light, using the material support statute in over 150 cases, with a conviction rate nearing 70 percent. Indeed, this statute has become an incredible tool in the hands of federal prosecutors seeking to shut down the support network of terrorist groups. However, it has not been without controversy. 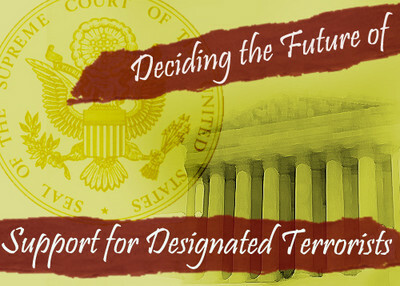 Despite its effectiveness, the material support provision has been attacked numerous times since its enactment, resulting in a multitude of legal challenges and legislative amendments, all aimed at producing a statute that could be used to destroy the terrorist support structure while not infringing on Constitutional rights. Now, with the Supreme Court set to rule on the validity of certain provisions of the statute, we finally have an opportunity to shut the door to frivolous litigation from individuals who simply want to provide support to groups that they sympathize with, regardless of their status as Foreign Terrorist Organizations. The petitioners in this case—a retired judge, a doctor, a human rights organization, and several nonprofit groups—were engaged in advocacy and support for the Kurdistan Workers Party (PKK) and the Liberation Tigers of Tamil Eelam (LTTE). Although the petitioners were engaged in these activities for quite some time, they were forced to cease on October 8, 1997, once the U.S. State Department designated the PKK and LTTE as "Foreign Terrorist Organizations" (FTO). Realizing that U.S. law now proscribed their efforts on behalf of the PKK and LTTE, on March 18, 1998 petitioners filed a complaint in federal court to bar the government from enforcing the statute against them. Now, after more than a decade of legal wrangling, the case has made its way to the Supreme Court. While a more detailed analysis of the policy arguments involved can be found in IPT's report, we briefly summarize the primary arguments. Opponents of the law are seeking to have it struck down, arguing that it is infringing on their ability to provide support to groups designated as Foreign Terrorist Organizations. While there are few people who would argue that they should be able to provide "safe houses," "false documentation or identification," "communications equipment," "facilities," "weapons," "lethal substances," or "explosives" to terrorist groups, there are plenty of people who continue to believe that they should be able to provide other support to these groups—typically because they want to support the non-violent activities of the group. Those in support of a broad ban on support to terrorist groups recognize, as Congress did when it passed the material support law, that the designation process was intended to make FTOs "radioactive." While providing an exception for legitimate First Amendment protected activities, the law is intended to ban practically all other support, whether violent or non-violent, to designated FTOs. This is the first opportunity that the Supreme Court will have to put its imprimatur on post-9/11 domestic counter-terrorism enforcement. More than anything else, this case represents an opportunity for the court to declare that all support given to terrorist groups is fungible. Even the provision of seemingly benign services bolsters a terrorist organization's efficacy and strength in a community. Although effective implementation of this statute may deprive terrorist groups of legitimately non-violent support, that is a cost that is justifiable and necessary when balanced against the efficacy of the statute. The opening brief of the Humanitarian Law Project can be found here. · Carter Center, Christian Peacemaker Teams, Grassroots International, Human Rights Watch, International Crisis Group, the Institute for Conflict Analysis and Resolution at George Mason University, the Kroc Institute for International Peace Studies at Notre Dame University, Operation USA, and Peace Appeal Foundation. The Government's brief can be found here. Our analysis of the case can be found here.